Off the Florida topic again but I just had to address an article that was recently in the Norwich Bulletin about this year's Fourth of July fireworks display. The article is titled "A first for Norwich fireworks this year: tickets"; the online version of the story allows for readers comments and boy howdy, are there some comments on there that just go to show how people seem to think they have a God-given right to things that were never in the Constitution - like the right to free fireworks shows at the downtown harbor. In a nutshell, fireworks celebrating the Fourth of July in Norwich have always been held downtown where thousands of people who don't live in Norwich, don't shop in Norwich, and never have anything else to do with Norwich would flock to create traffic gridlocks, impossible parking situations, a lot of litter and other assorted mayhem. A good number of those people would also utilize the 911 system to call and ask when the fireworks were and where was the best place to park? In years past, those same crowds would also cause traffic problems so bad that the police, the fire department, and ambulances could not respond to emergencies in a timely manner. Suffice it to say, it was a mess and I'm pretty sure it didn't add to the revitalization of downtown Norwich at all as people would swoop in like a horde of locusts early enough to get a good spot and then crawl back out again in major traffic after the last boom had echoed through the city. I doubt very few of them took the time to visit any of the downtown businesses that might be open unless it was to see if there was a public restroom available. Last year the downtown fireworks came really close to not happening due to the downturn in the economy which caused not only the great Mashantucket Pequot Nation and Foxwoods Casino to pull their sponsorhsip but a lot of other small businesses just didn't have the money to contribute either. Norwich - like so many other cities in the country - just didn't have the money that it cost to put on a fireworks show that wouldn't leave people mumbling and grumbling that they drove all the way to Norwich for this? Things were looking pretty grim until Ron Aliano, my boss and the owner of American Group, stepped in and saved the day. Even though he wasn't a native son of Norwich, Ron loved Norwich and did all he could to promote it and put it in as good a light as possible. Ron was also a patriot who loved his country and the Fourth of July so he worked tirelessly and rallied support from others as well as kicked in a large chunk of money of his own to make sure the fireworks happened. Sadly I doubt that very many of the thousands of people who packed downtown Norwich last year even knew that it was Ron who had saved the day - they just knew they were going to watch free fireworks. Unfortunately for those of us at American and the city of Norwich, Ron passed away last year and the city lost probably it's very biggest fan. Without Ron's driving support and devotion to the city that he loved, it looked like there were going to be NO fireworks at all in Norwich to celebrate the Fourth of July - the money still wasn't available in the city's coffers nor was it forthcoming from any other place as no other sponsors were stepping up to take over where Ron had left off. The Norwich Arts Council and Rose City Renaissance were doing their best to get something put together for downtown but without funding, it just wasn't happening. 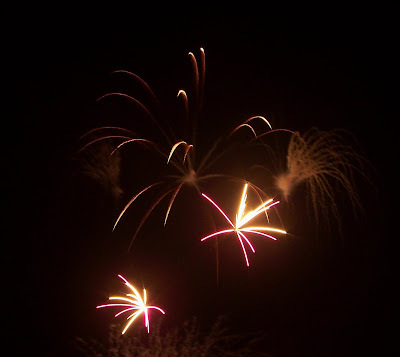 Just as it looked like the skies above the Rose City were going to remain dark over the Independence Day weekend, the Connecticut Tigers stepped up and offered to give the city a fireworks show at Dodd Stadium in the industrial park. The Connecticut Tigers are the Single-A ball club of the Detroit Tigers who now occupy the stadium that the Connecticut Defenders abandoned; they just opened their inaugural season here in Norwich last Saturday and are doing their best to become part of the community. Now even though this is definitely a good thing, here's where all of the whining comes in due to the fact that rather than the fireworks being a free-for-all at the harbor, tickets are going to be issued (for free) as there is obviously limited seating at the stadium. Along with that - and this is REALLY where the whining comes in - there will be parking available at the stadium for $5 per car or free shuttle service available from just down the road at Computer Sciences Corporation. It seems that most people are completely and totally aghast that they are going to have to pay for parking to go to a fireworks show that's being put on for free and how does Norwich have the unmitigated gall and nerve to not be putting on a free show in the harbor?? Okay, nothin' for nothin' folks but fireworks are expensive and not only is the cost of the display something that needed to be factored in but there's also the cost of clean-up for when those hordes leave the downtown area, the overtime cost of all the extra police officers that have to be brought in to keep the unruly crowds under some sort of control, the cost of insurance which is always very high, and other costs that add up very quickly. Just who did everyone think was going to pay for this?? Instead of being grateful that the Connecticut Tigers offered to hold a fireworks display at their stadium, people are carping and complaining and whining that this is what's killing the downtown area of Norwich. Seriously? What's killing the downtown area of Norwich is not the absence of the Fourth of July fireworks but the absence of anyone having any interest to go to downtown Norwich at other times. How many of those people commenting on the article have ever done more than passed through downtown on their way to someplace else? Chances are good I could count them on one hand and have fingers left over. People also seem to think that somehow the Tigers are going to be getting rich off of charging people $5 to park at the stadium but I sincerely doubt that's the case as the Tigers are no doubt putting out a good chunk of change for this event. The team is out of town for road games but there's the cost of electricity, the cost of stadium employees, the cost of insurance because you sure the heck can't have fireworks and thousands of people in one place without insurance, and the cost of the fireworks themselves. Granted, the Mohegan Sun and Atlas Pyrovision have also stepped up to help sponsor the show but these things are expensive and I doubt that charging $5 per car to park is putting any large sum of money into anyone's coffers. I just don't get why people seem to think they have the right to a free fireworks show on the Fourth of July; that instead of saying 'thank you' to those who have made this event possible they want to complain and criticize and even suggest that the director of Rose City Renaissance should be fired. Seriously? What is wrong with people that they all seem to think that they are entitled to things that cost other people a whole lot of money and that they are entitled to those things for free? It's been mentioned in the comments to the article that Ron Aliano would be rolling in his grave about the decision to not have the fireworks downtown but even though I'm sure he would have been disappointed, I think that as the good businessman that he was, he'd understand the reasoning behind having the fireworks at Dodd Stadium and would have been glad that someone stepped up to the plate to offer Norwich some sort of fireworks display AT ALL! Perhaps in the future the City of Norwich should set up a fund that people can donate to throughout the year for the cost of each year's fireworks extravaganza. Heck, put a PayPal button on the City's website and put donation tins at all those downtown businesses that no one goes to and then next year the fireworks display could return to the harbor. I don't think that would be asking so much but I'd be willing to bet that there are people out there who think they should be able to watch fireworks free and clear without ever paying a dime or think about who it was that foot the bill on the whole she-bang; the City of Norwich owes them a free fireworks display in the harbor! To me, that's pretty much what all of those readers' comments on the article were saying and that's just too bad because that's not the way it should be. Personally I'd like to thank C.J. Knudsen and the Connecticut Tigers for offering to light up the skies for the holiday even if it's not the usual skies that are lit up and I sincerely apologize for the lousy welcome you've received to Norwich but alas, that's why the city suffers like it does and nothing good ever comes here or stays here. If it isn't apathy then it's complaints. As for those who want to do nothing but complain about the fireworks that almost weren't at all, go to Sailfest in New London/Groton next weekend and battle the crowds down there instead. Chances are good you're going to spend a lot more than $5 in the long run as well as spend a lot of time in gridlock trying to get out of there but hey, they're free! In Baltimore this year, they are scaling back a lot of the fireworks due to major budget constraints. Last year they tried hiring a different fireworks company that used cheaper and "more orchestrated" fireworks and they didn't get as much applause--but it is free to attend (if you can find a place to park and sit). I'm amazed that people actually call 911 to see when the fireworks were--do they get fined for that?! When you are right you are absolutely right. Even Tacoma's Freedom Fair while still free has a "suggested donation" of $1 for children and $5 for adults. In economic times such as this, the freeloaders need to lighten up. We have too many freeloaders. Way too many. I am so with you on this. Instead of thanks they get complaining. Yep, I know a lot of these kinds of people. We're going cruising. Having to wait until February is going to be tough though. There are always some who will complain about anything. Don't hold back, Linda. Tell us what you really think! Unmitigated gall about covers it. Theses freeloaders should take a lesson from Freddie the Freeloader. He was not only sweet, kind, and optimistic but he was also generous with what little he had. Oh, I haven't thought about Red Skelton in years. Gosh, I miss him. Life is usually filled with people who do everything and get taken for granted. Then when they tire or can't do it anymore the complaints come. I shall say it again Linda...you are one of the most logical and reasonable people I know. Before I bought my condo I lived in an apartment in Renton WA. From my balcony I could see at least 7 different fireworks displays from communities surrounding Lake Washington. Those communities were as close as a mile and as far away as 15 miles. My point is...to those who are complaining, you don't have to be right under the fireworks to enjoy them. If you don't want to pay the $5 to park, then find a spot along the road and watch the fireworks from there. well thought out and well written!!! Excellent post! They still sell fireworks here, and let me tell you, it's like a war zone. And the cordite hangs in the air for days. Asthmatics and people w/breathing problems are advised to stay indoors! You know as well as I do, after working with the public, a lot of people are major idiots!!!! !